I looked over my UFO pile, then glanced at the calendar, and decided to finish a Christmas quilt. Many years ago, I collected Christmas fabrics, several in batiks, and put them together with the Turning 20 pattern. Now, I have to come up with a backing. I would love to buy some extra wide fabric and not mess with piecing a back, but I am trying to stick to a budget and use up my stash. So I dug around for some of the leftover prints and calculated a patchwork layout that would fit. The top is 65 x 80, so I am making the backing about 70×88. 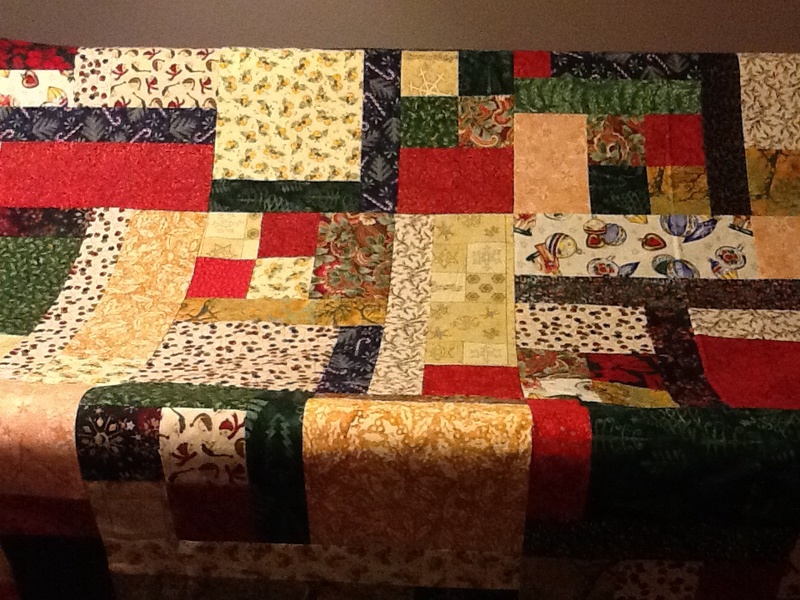 I cut 20 squares at 16-1/2″ (the size of my largest ruler, lol) and added a 6.5″ strip in the center. 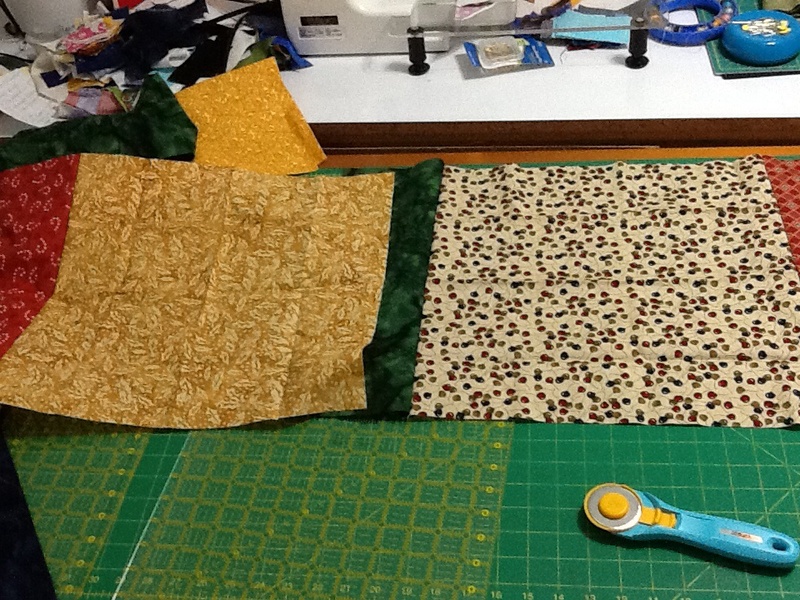 I sew all my backing seams at 1/2″ and press them open. I will need an 8″ strip across the middle to get the right size back. I have a new pantograph with poinsettias and holly leaves, so I should finish this today. Stay tuned! I have spent much more time knitting lately. I was able to gift this cowl (infinity scarf) for one of my daughter’s skating coaches. The yarn is Lorna’s Laces Shepherd Worsted in a limited Frozen colorway. 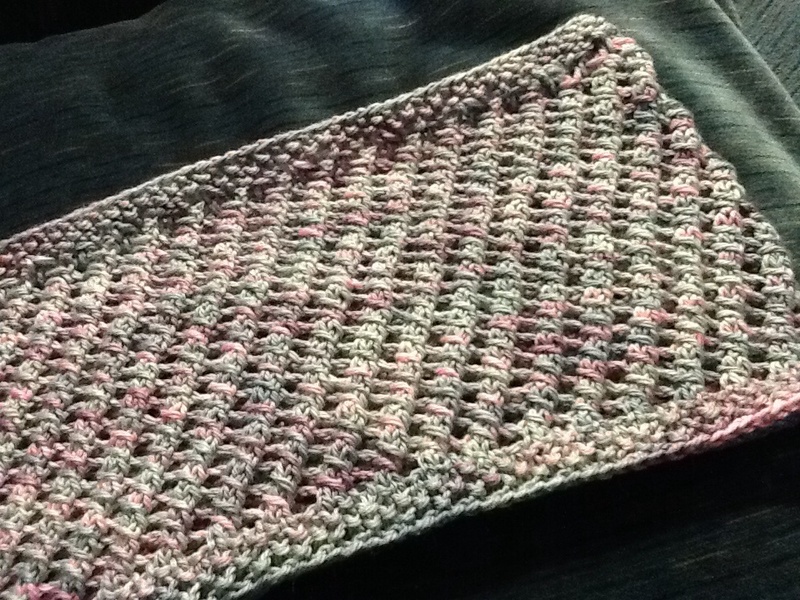 The pattern is the Bar-Hopping Cowl. I knit to a width of about 8″ and a length of about 60″ – perfect to loop twice around your neck. 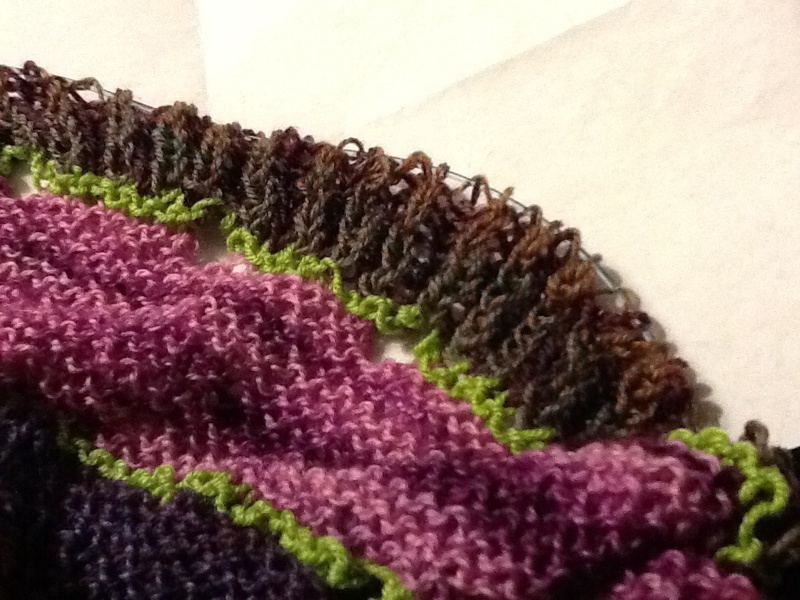 I am making progress on Stephen West’s 2014 Mystery Shawl. This section uses two color brioche, which is a fairly easy stitch with fabulous results. However, my stitch count was off at the end of the section and there was no way to add stitches without throwing off the whole pattern. So…I ripped back the whole thing 😦 Hopefully things work out better the second time through! We are enjoying a few days of vacation as we get ready for US Thanksgiving. We have an invitation to a friend’s house so I am relieved of cooking duty, for which I am VERY grateful! !